In partnership with HRSG and IBM, TalentGuard offers the most robust ready to use library of industry-specific competencies and job profiles. Our talent framework library is composed of 2,500 competencies and more than 3,000 job roles ready for use in our Talent Management Suite. Our focus on iterating competencies rather than creating them saves HR time and money, and reduces risks common with rolling out competency initiatives. TalentGuard’s competency library is organized into four categories including: Core (impact to culture and values), Leadership (impact to strategic management skills), Functional (impact to job families) and Technical (impact to the specific job role). Each job profile defines key responsibilities, job level, core competencies, functional and technical skills, interview questions, coaching tips, SMART goals and prescriptive learning suggestions. TalentGuard’s consulting team helps you customize, control and publish job-related content that matches your skills-based workforce development strategy. Our library contains jobs organized and grouped by function and industry. Each job role includes a title, code, description, four primary responsibilities, and 5 levels of competency proficiency. 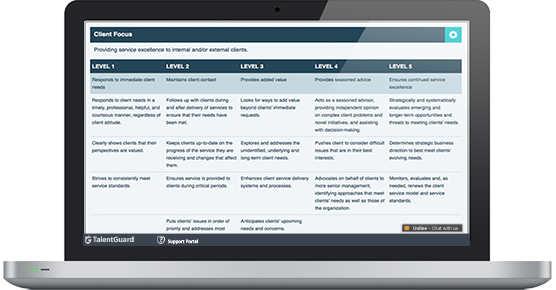 Our competency framework contains thousands of skills across 22 industry segments. Each competency comes standard with 21 or more behavioral statements across four to five levels of proficiency. This helps set clear expectations of what good looks like in specific job roles. Competencies are associate with suggested readings and training including experiential, web-based, group sessions and seminars. Both quantitative and qualitative SMART development statements are provided to facilitate learning and development for employees. Interview questions are aligned to the competencies associated to the job role. This enables consistent selection over time for positions. Provides managers with recommendations on methods to improve behavior and experiences that need to be shared. A politically correct and defensible library of performance comments by competency and rating scale that can be used by managers during performance evaluations. Ensures clear goals and expectations are aligned to the competencies and skills required of the job role. Ensures your institutional memory/DNA is repeatable, flexible and scaleable across job families and the organization. Setting best practices and consistent job focus enables you to have better control over pay-for-performance initiatives. Align assessments to the high impact competencies required of the job role. Have more questions? Want a real person to share more information on TalentGuard Competency offering? We’re happy to help out!